Port25 Solutions has pioneered email authentication from the very beginning. Key events in email authentication show that Port25 was first to announce support for Yahoo's Domain Keys, and to support Microsoft's SenderID. 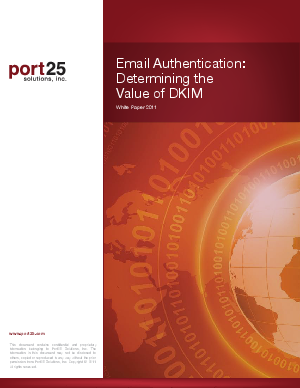 Once again, Port25 is at the forefront of email authentication, working to establish broad support for the use of DKIM. The integral role of DKIM is to determine that there is a verified identity which can take responsibility for the incoming message. In and of itself, DKIM does not necessarily increase the chances of a message arriving in someone's inbox. What it does do, in its simplest form, is validate the integrity of the message, thereby assuring that it has not been tampered with during transit.